The most lauded composer of his generation and one of the greatest composers of the entire Renaissance. Of northern French background, the composer whose full family name is now known to have been "Jossequin Lebloitte dit Desprez" most likely began his career in the mid to late 1470s as a singer at the court of Rene of Anjou at Aix-en-Provence. 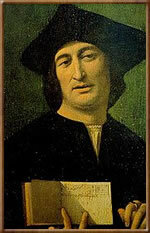 He may have had ties with the French royal court of Louis XI circa 1480 before traveling to northern Italy, as did many northern-trained musicians, to take advantage of the thriving patronage of music by Italian courts in the latter half of the 15th century. By 1484, we know the composer was in the service of Cardinal Ascanio Sforza of Milan and traveled with him to Rome when Sforza was appointed Papal Vice-Chancellor. Josquin was a singer in the Sistine Chapel choir from 1489 to about 1495, is known to have visited northern France c. 1499 and was attached to the Ferrarese court of Ercole I d'Este from about 1503-04. Thereafter, he retired to the northern French village of Cond-sur-Escaut in the province of Hainault (possibly near his birthplace) where he spent the final two decades of his life as a provost at the collegiate church of Notre Dame.